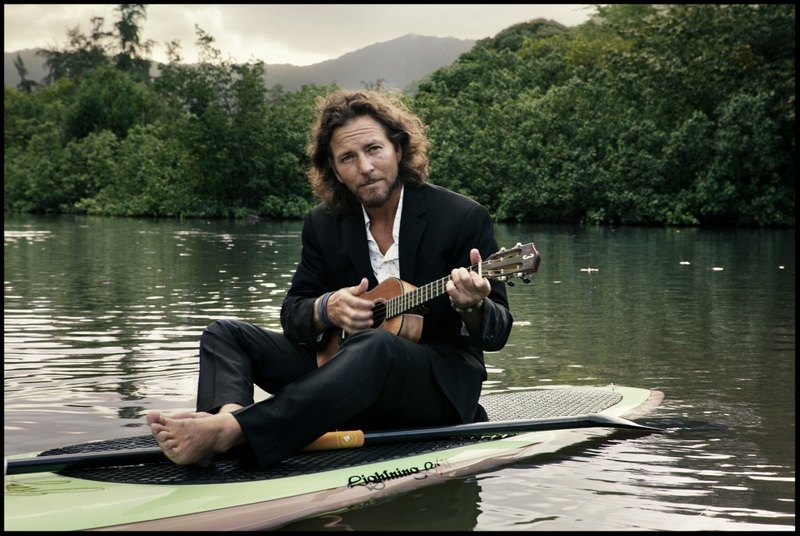 Eddie Vedder has been touring with Glen Hansard for the last few weeks. Unusually, there doesn’t seem to be an obvious reason for this tour, no album to promote, just two musicians enjoying each other’s company. Recent world events meant long delays getting into the venue, we arrived just as Glen Hansard was finishing his set with the bluesy number Way Back In The Way Back When, throwing in a snippet of Pearl Jam’s Present Tense for good measure. From the minute Eddie Vedder arrived on the stage he had the huge crowd eating out of his hand. Every song received a rapturous reception. He played a selection of Pearl Jam songs, plus some of his own solo material along with some covers. Playing to his key strength, his wonderful voice, he sang mid-nineties classic Elderly Woman Behind The Counter In A Small Town, along with the more recent Thumbing My Way and I Am Mine. Joined by a white coat wearing string quartet (Red Limo String Quartet), he performed a goosebump-inducing version of Jeremy, preceded by a long rambling joke which concluded with him asking “what’s the Point? It’s a great place to play in Dublin”, a joke he coined on stage with Pearl Jam in 2000, believe it or not. Heartfelt songs from his Into The Wild soundtrack like Guaranteed and Society (where he was joined by Hansard) alternated with rabble rousing versions of Porch and Better Man, all of which sounded excellent, even in such a large venue. It didn’t all work, he was joined by a member of the audience to sing Black, which was a bit strange, while covers of The Beatles’ You’ve Got To Hide Your Love Away, David Bowie’s Heroes and Glen Hansard’s own Falling Slowly seemed needless, when Vedder himself has so many strong songs of his own. A second encore added a local flavour as Hansard & Vedder sang The Auld Triangle together, after which poet Stephen James Smith recited his poem Dublin. After blasting through Neil Young’s Rocking In The Free World and a third encore of Hard Sun they finished, nearly three hours after Vedder opened his set. A set that showed off an old school rock singer with a real command of his audience. As big, old-fashioned shows go, this was one of the better ones.